Sussia, the Palestinian village in which structures are slated for demolition, sits on private Palestinian land owned by local people, according to a document of the Defence Ministry’s Civil Administration obtained by Haaretz. Despite the findings by Civil Administration officer Moshe Meiri, Sussia residents still need building permits in order to prevent the planned demolition. Meiri’s report, however, appears to counter the reasoning that building permits cannot be issued to the local people because of a lack of ownership papers. It appears that the Sussia residents cannot be forced to leave Sussia because the village is built on private land. Even if structures there are demolished, village residents could use the land for agricultural purposes. The Palestinians could build structures under the master expansion plan that allows for basic structures for agriculture. Structures currently on the ground could be altered to fit this plan. The internal document was drawn up following an inquiry by the Jabor family, which bases a claim to land near Sussia on Ottoman documents from 1881. In recent years, the Civil Administration has demolished Jabor-family tents and trees a number of times. The family filed an appeal with the help of attorney Jad Nasser and claimed ownership of the land. According to Meiri, a Civil Administration officer responsible for land administration in the West Bank, the Ottoman deed is indeed valid. The same type of deed has also been mentioned by the State Prosecutor’s Office, which has ruled on the borders of various settlements. The deed was problematic because the boundaries mentioned were unclear, described in terms of geographic features that turned out hard to identify on the ground. But Meiri managed to locate them and found that they indeed included land belonging to the Jabor family, as well as to the Nawaja family. At the end of ruling, Meiri wrote that the orders issued to the Jabor family should be cancelled and that previous court rulings on Sussia should be discussed. Meiri’s ruling came as a surprise to the Civil Administration, especially the head of the Coordinator for Government Activities in the Territories, who had personally intervened in the Sussia matter. The wider ramifications of Meiri’s findings are still being considered. Sussia is located in the South Hebron Hills near the town of Yatta, which in turn is near Hebron. The village, home to 40 families, does not have a valid master expansion plan, and no building permits have been issued in the area. Following a petition filed by an organization funded by the right-wing group Amana, the High Court of Justice ruled that the government must demolish the village. Sussia residents filed a request with the Civil Administration two years ago, asking for building permits, but their request was rejected. Afterwards, they petitioned the High Court to legitimize construction that had already taken place. The hearing on their petition was postponed. This month, the Civil Administration has said it intends to demolish the illegal structures after the Id al-Fitr holiday that ends Ramadan. The Civil Administration’s announcement led to pressure from both the U.S. government and the European Union in Brussels. The Americans warned Israel that demolishing the village would have severe ramifications, and the Europeans called for Jerusalem to cancel the “transfer” of Sussia residents. The Civil Administration ultimately backed down from its intention to carry out the demolition after Id al-Fitr. Sussia residents claim ownership over the lands on which their village sits and have already presented deeds dating to the Ottoman period that cover an area of 3,000 dunams (741 acres). The Civil Administration has so far denied their claims. In October 2013, for example, when the Civil Administration rejected a master expansion plan put forward by the residents, one explanation was that sufficient ownership documents had not been submitted. Halimi said the ownership documents submitted then did not contain any geographic information and that it was “not possible to make unambiguous claims of ownership over the land in question” based on the documents. Also, the planning council said it could not legitimize structures already built because the local people did not have sufficient funds for infrastructure or education, and that it would be preferable for them to move to nearby Yatta. 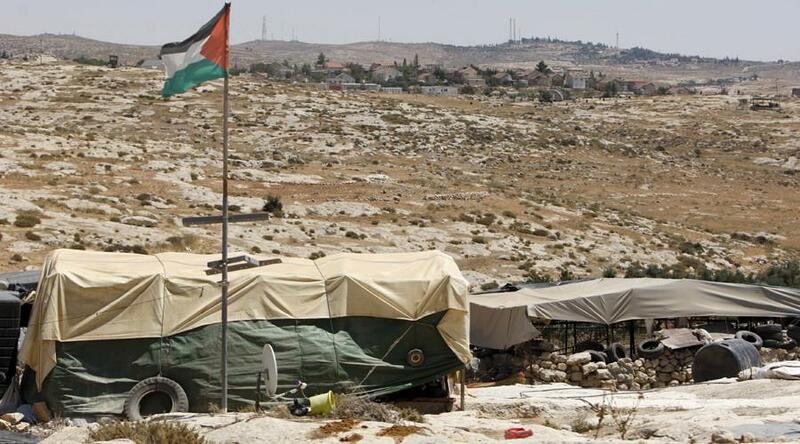 Contradicting the official stance of the Israeli army and government, an Ottoman land ownership document dating back to 1881 suggests that the territory on which the Palestinian village of Susya is located does in fact belong to the residents of the area, Haaretz reported Sunday. The report cited an internal review offered by the Civil Administration, Israel’s military governing authority in the West Bank, last week. Israel’s Supreme Court ruled last month that the Civil Administration had the right to demolish Palestinian homes in Susya because they had been built without authorization. Susya’s residents argue that they had no choice but to build illegally, because the Civil Administration rarely grants permits to Palestinians in the West Bank’s Area C, a zone controlled by the Israel Defence Forces as per the 1993 Oslo Accords. The Civil Administration’s refusal to grant building permits to the residents of Susya was based, among other issues, on the perceived lack of land ownership documents. However, the 1881 Ottoman-era document was recently deemed to be both authentic and legally valid by a top staff officer in the Civil Administration, Moshe Meiri, who is responsible for the management of land in the West Bank. Meiri stated that the land specified in the document includes the area of the Palestinian village. The document was also mentioned in a 1982 report by Pliah Albeck, who was the director of the Civil Department at the State Attorney’s Office, which determined the legal boundaries of West Bank settlements, the report said. Following the release of the internal review, officials in the Civil Administration were reevaluating whether to go ahead with the demolition, the report said. Throughout the nineties, the IDF carried out small-scale demolitions in Susya, claiming all residential structures on the land were built illegally. In July 2001, the entire village was destroyed a day after the murder of Yair Har Sinai, a shepherd from the nearby Jewish settlement of the same name. The village was later restored, but now faces the prospect of another demolition. In June, diplomats from all 28 European member states travelled to Susya to protest Israel’s decision, and two weeks ago, the US warned Israel to not dismantle the village’s structures. “We strongly urge the Israeli authorities to refrain from carrying out any demolitions in the village,” State Department spokesperson John Kirby said in a press briefing. He added that the evictions and demolitions “would be harmful and provocative” and urged Israel to work with village residents to find a solution. It is long since there was such a wide response to a call for a demonstration in the wild West Bank. Among the passengers could be seen quite a few long-time activists who had however not been seen in recent years. Why did the case of Susiya evoke so much attention, in Israel and throughout the world? (Circulating on the bus was the current New York Times op-ed page, featuring a moving personal story of a Susiya resident). This tiny threatened village is in every way worthy of support and solidarity – but in the past, quite a few instances of no less outrageous injustice have been perpetrated and met a virtually complete indifference and silence. One can never know in advance which particular case will become the focus and symbol of a struggle. Little more than an hour’s drive separates the vast metropolitan Tel Aviv from the godforsaken hamlet of Susiya in the middle of the desert. First the travel is along congested intercity highways – then, through back roads which become ever more narrow and in bad repair, the further one continues to the east and south. Somewhere, without noticing, the Green Line is crossed into the territory where there is not even a semblance of democracy, where the landscape is predominantly brown rather than green – apart from the occasional green patch of a settlement, which had the privilege of being connected to the Israeli water system. At the end of the trip, the narrow road forks, and the sign to the right side says “Susiya” – but nevertheless, we turned to the left. The sign erected by the military authorities refers to the other Susiya – the Israeli settlement Susiya, which claims to be the continuation of a Jewish village of the same name which existed on this location during the Roman and Byzantine period. “Come and see Susiya – an ancient Jewish town” says the sign on the road we had not taken. 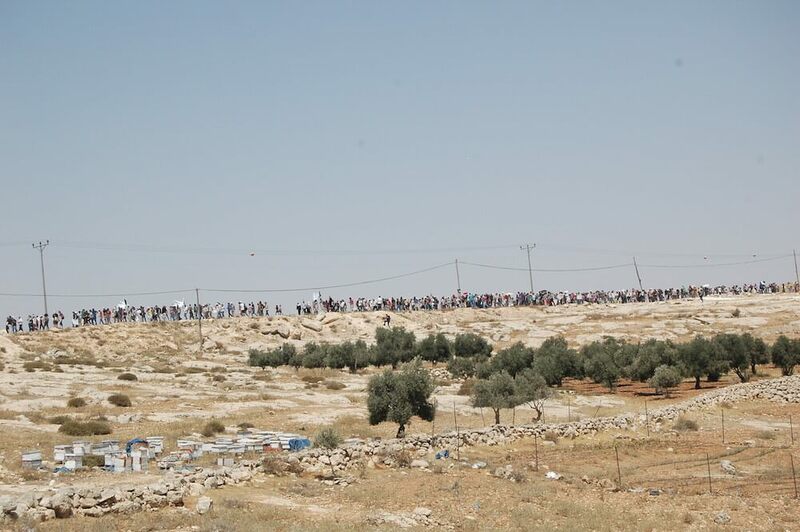 Israelis walking the rough track to Susiya to join the demonstration. Photo by Allison Deger. There are no road signs, but it is not difficult to find Palestinian Susiya, with the Palestinian flag painted on rocks along the road. Four buses arrived from Tel Aviv and three from Jerusalem, plus quite a few private cars, and a minor traffic jam was created in the middle of the desert. “Pay attention, it is now the hottest hour of the day, it’s one of the hottest places in the country, and there is almost no shade” warns the young woman in charge of my bus. “Please be sure, all of you, to cover your heads and take water with you. For those who have not brought it with them, we provide bottled water”. On a low ridge above the bus could already be seen a human stream winding its way towards the rally. He was followed by Professor Yigal Bronner, who teaches history of India at the Hebrew University of Jerusalem and is a prominent activist of the Ta’ayush Movement, which is active already for many years in support of the residents of the South Hebron Hills. “We are here in Susiya. What is Susiya? Not much. Some cisterns which the army had not filled with dirt, a few sheep which the settlers have not yet stolen, some olive trees that have not yet been cut down. What is Susiya? Susiya is 350 people who hold on to the land, clinging and clinging and holding on and not giving up, because it’s their home. Quite simply, this is their home. Opposite us is the other Susiya. The Susiya which is armed and surrounded by a fence, which is connected to to water and electricity and sewage and has representatives in all the corridors of power, and it wants to grab what little is left of this Susiya where we stand. Susiya against Susiya, this is the whole story. The Palestinian Susiya has no soldiers and no police and no representatives in the Knesset and in fact it does not have the vote. But it has us. We are here to stand with Susiya and we will not leave. We will do everything we can to be here and prevent the destruction. And if does take place, we will be here the next morning to rebuild, together with the residents. Susiya is not alone! “(Chanting of “Susiya, Sussiya do not despair, we will end the occupation yet!” in Hebrew and “Yaskut al Ikhitlal”, “Down with the Occupation” in Arabic. At the end of the march, dozens lifted with great effort a 30-metre long sign reading: “Susiya is Palestinian, and Palestinian it will remain!”. When the buses on the way back passed the official sign about “The ancient Jewish town” we could see it at the top of the ridge above the road. Whether or not Sussia is saved from destruction, Israeli bulldozers will continue their work on others. The United States and Europe in recent days made out a check in the name of “Sussia.” Once again they have raised expectations about their ability to put the brakes on Israel’s colonizing madness. The temptation to be optimistic is great. The fear of bitter disappointment (and the joy of the enemies of logic) are even greater. Although Sussia is not a story that moves the Israelis as a whole, the bleeding hearts among us draw encouragement from the fact that at least this particular check might be cashed. That is, that the plans to destroy the village might not be carried out. Sussia has become a symbol. And that is precisely the trap. The European foreign ministers know the name of this village in the southern Hebron Hills as if it were a suburb on the way from the airport to Brussels. The spokesman for the U.S. State Department rolls the name off his tongue as if he had drunk coffee in one of the tents slated for demolition. The call on Israel not to uproot Sussia (and the generally unnoticed Bedouin community of Abu Nwar) is specifically included in the conclusions of this week’s monthly meeting of the EU Foreign Council. It is very unusual that such a small place is mentioned in the written conclusions. The State Department spokesman knew to say that the implications of demolishing the village were greater than the impact on its inhabitants. He also said the demolition would set a damaging standard for displacement and land confiscation. How many harsh documents by the European Union have we read in recent years, including a sharp analysis of the danger in which Israel’s policies place the fate of the two-state solution? True, with modest European funding, various services were and are provided to tens of thousands of Palestinian residents of Area C (water, prefabricated structures, solar-heating systems) – which makes it easier for them to wage their heroic struggle against Israeli displacement plans. The European Union regards the cautious funding as a broad hint that it does indeed envision Area C (60 percent of the West Bank) as an inseparable part of the future Palestinian state. But Israel does not understand hints, it only benefits from the flow of European charity that prevents the humanitarian disaster from growing worse. Because Sussia has become a symbol, along with its courageous and stubborn inhabitants who have so far thwarted plans to wipe out their community (supported for many years by Israeli organizations, chief among them Ta’ayush and Rabbis for Human Rights), it might be saved. Then the Western foreign ministries will note with satisfaction that their warning worked. But Israeli bulldozers will quietly turn, helped by Israeli public support, to continued destruction of lives and homes in other Palestinian communities, no less courageous and stubborn – just less well-known. Or, on the other hand, perhaps precisely because Sussia is a symbol, Israel will decide to arm wrestle over it, treat it as a special case, and demolish it. And what will Europe and the United States do then that they have not done yet? Will the United States cease its security co-operation with Israel? Will Europe recall its ambassadors and close its airports to Israeli tourists? Perhaps the statements about Sussia do show a change of approach, and that Western patience, even that of the United States, is eroding for the Israeli pyromaniac. But the pace of change and erosion is much slower than the fire. 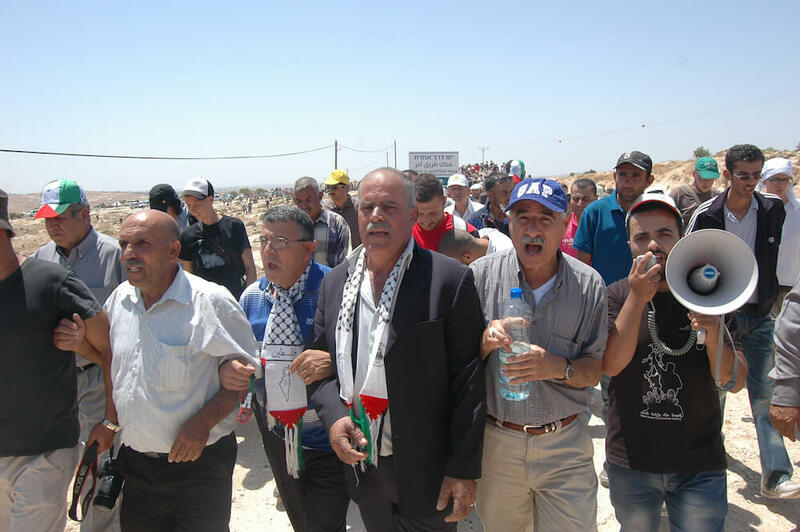 Palestinians from Susiya lead protest against the upcoming demolition of their village. Photo by Allison Deger. The tiny hamlet of no more than 350 residents has managed to garner international headlines over the recent week, raising the issue of Israeli demolitions in Area C of the West Bank, the Oslo-delineated section of the occupied Palestinian territory under full Israeli control. In this region building permits are scarce, 98% of requests are rejected according to the Israeli planning rights organization Bimkom. And the consequence for constructing homes without a permit in this area is demolition. “I’m very happy about it and people in government will see it,” said Nasser Nawaja, 33, on his op-ed published in the New York Times yesterday, aptly titled “Israel, don’t level my village.” Days before, Nawaja appealed to delegations from the State Department and the European Union parliament. “This time I told them, I asked that that history will not repeat itself,” Nawaja said explaining his village has been destroyed twice in the past—in 2001 and 1986. Susiya’s plight has even caught attention in Washington. Just under two weeks ago State Department spokesperson John Kirby issued an unusually stern warning for Israel. “We’re closely following developments in the village of Susiya in the West Bank, and we strongly urge the Israeli authorities to refrain from carrying out any demolitions in the village. Demolition of this Palestinian village or of parts of it, and evictions of Palestinians from their homes would be harmful and provocative,” Kirby said. Brimming with glee Nasser shuffled off to greet his reinforcements. Around 500 Israeli activists from left-wing human rights organizations bussed in from Tel Aviv and Jerusalem to march in 100 degree afternoon heat. “I hope very much that it will have impact,” Nasser said. “We have seen the international diplomatic pressure, we have see the press coverage and the goal today is to show that there are many many Israelis who say to oppress people here cannot be done, and certainly not in their name,” said Rabbi Arik Ascherman, president of Rabbis from Human rights, an organization that is providing Susiya with legal support. This was Rabbi Ascherman’s second visit to Susiya in the past week. 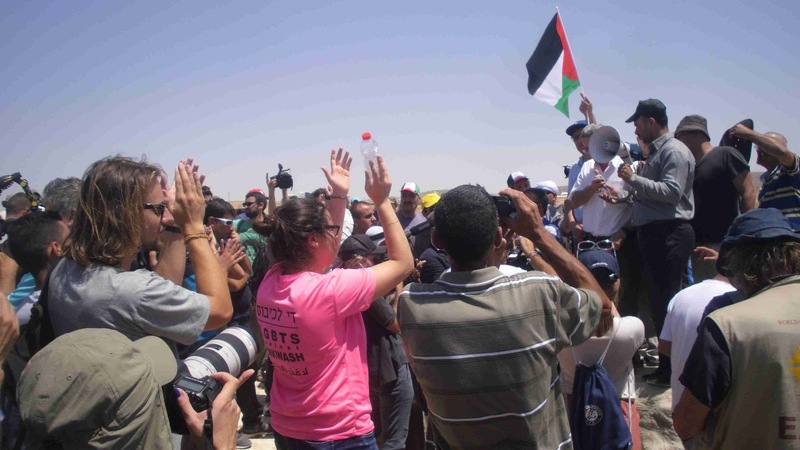 Protesters then marched over Susiya’s unpaved roads towards an Israeli highway, holding an impromptu rally. Israeli border police were positioned in Jeeps near the village’s entrance, but out of eyeshot from the demonstration. Historically Susiya’s residents lived in stone houses and caves around one mile from their present day village. Their mosque was built atop the foundation of an abandoned sixth century synagogue. The original mosaic tile floor is still intact, but all other parts of the structure were dismantled in 1986 when Israel made an unprecedented expulsion, citing a national interest to construct a tourist bible park because the town sat atop ancient ruins. The state decided preserving the artifacts outweighed the Palestinians’ rights to remain on their land. That area is now called “Sussia,” and is administered by an Israeli settlement of the same name. Both Sussias surround Palestinian Susiya. The settlement hopes to expand to where Susiya’s village is today. “If they destroy the houses, we will stand under the sun. We will build the tents again. We will never leave this place, it is our fathers’ and our grandfathers’ place,” said Mohammed Nawaja, 70, as he sat in a protest tent decorated with Palestinian national posters and plenty of small plastic cups of Arabic coffee to offer to the Israeli guests.